3. iCloud only gives you 5GB for free. If you choose iCloud or iTunes, you may not get very happy backup experience. Besides iTunes and iCloud, you still have other methods to backup iPhone photos to Mac with no efforts. Airdrop, iPhoto, the third-party software, and so on all can provide the solutions for you to transfer photos from iPhone to Mac computers. The guidance below will detailedly show you how to do that. When it comes to transferring photos from iPhone to Mac, iPhone transfer software for Mac are always be regarded as one of the best choices. Among all the iPhone transfer programs, Leawo iTransfer is regarded as one of the best. This software is used for transferring files among iOS devices, iTunes and Mac computers, and it enables users to transfer various kinds of files without using iTunes. The following guidance will show you how to transfer photos from iPhone to Mac, and you can free download the software to have a try. Step 4. 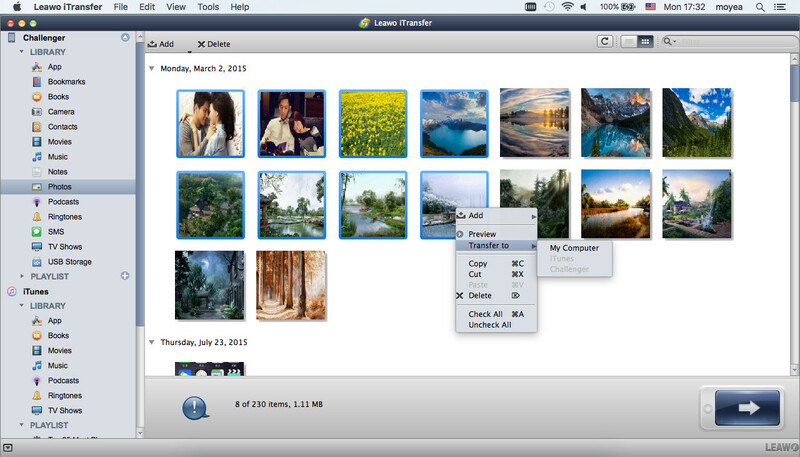 After selecting photos, you’ll see a pop-up dialog. Check Save to Folder and click Change to choose a folder on your computer to save the photos. Then click Transfer Now to to backup photos from iPhone to Mac computers. When the transfer finishes, you will get the photos in target folder. With Leawo iTransfer, you can easily copy photos from iPhone to Mac, and you are also allowed to transfer other kinds of files with this software, for example, you can transfer music from iPhone to computer with Leawo iTransfer. Apart from iPhone transfer software, iPhone recovery software also supports to backup iPhone photos to Mac. Leawo iOS Data Recovery for Mac is powerful iPhone backup software and iPhone data recovery software, it helps MacBook users to backup iPhone, iPad and iPod touch files to MacBook, and recover lost data from iTunes backups and iOS devices. If you want to backup iPhone photos to Mac, this software is a good choice. You can check out the following guidance about how to backup iPhone photos to Mac, or free download the software to have a try. Note that the trial version stops at the preview window. 1. 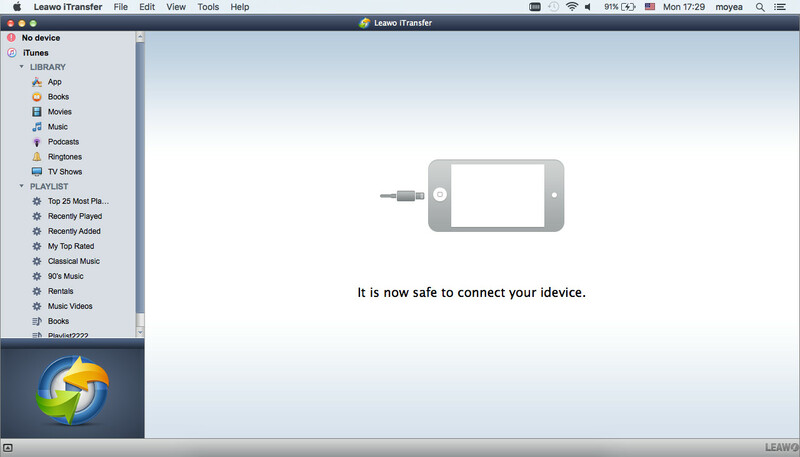 Run Leawo iOS Data Recovery for Mac on your MacBook, and connect iPhone to the MacBook with the USB cable. The software will pick out your iPhone in the list at the bottom of the window, and show a “Start” button in the middle. Click the button and the software start analyzing your iPhone. 2. After the analysis of your iPhone, the software will scan the contents in your iPhone. 12 categories will be listed in the left sidebar, and their names will turn white when the scan is done. Click “Camera Roll” and then the photos will be shown in the right part of the window. Check the photos you want to backup and then click the “Recover” button at the right bottom of the window. If you want to transfer all the photos from iPhone to Mac, you can check the square button beside “Camera Roll”. 3. 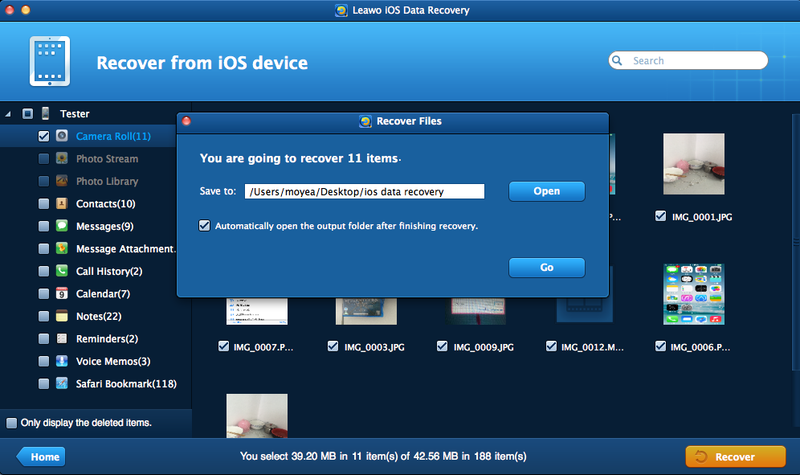 After clicking the “Recover” button, you will see a pop-up dialog. 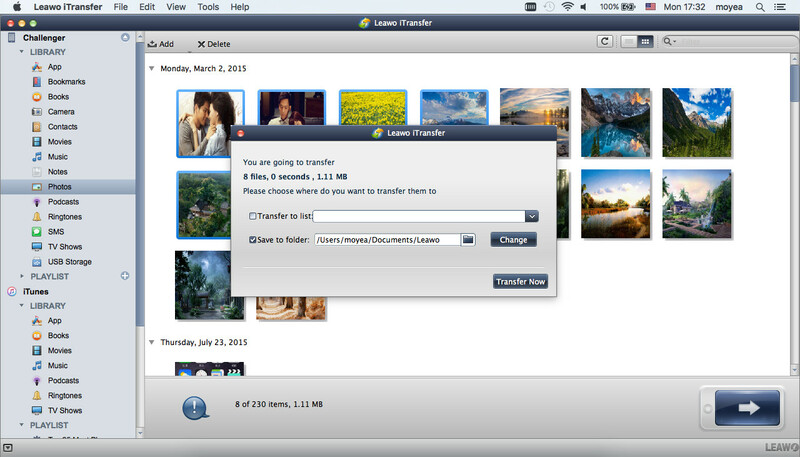 Click “Open” in the dialog and then you are able to choose a folder on your computer to save the exported photos. Then click “Go” to start importing photos from iPhone to Mac. When the backup process is done, you will find the photos in the target folder. 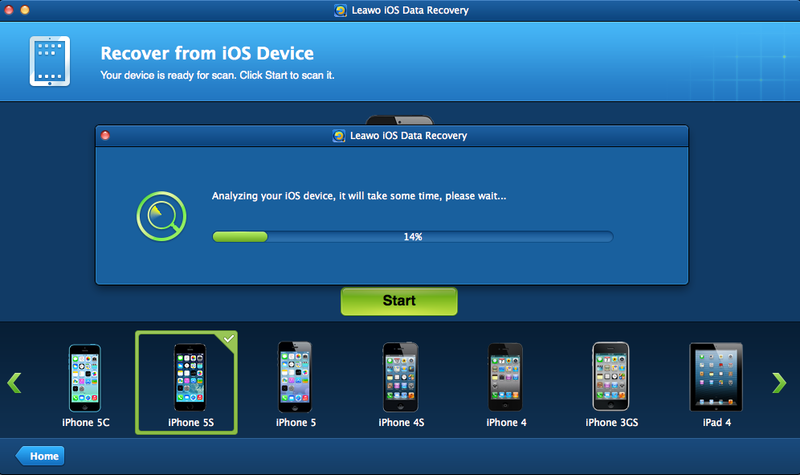 Leawo iOS Data Recovery is helpful on this issue. 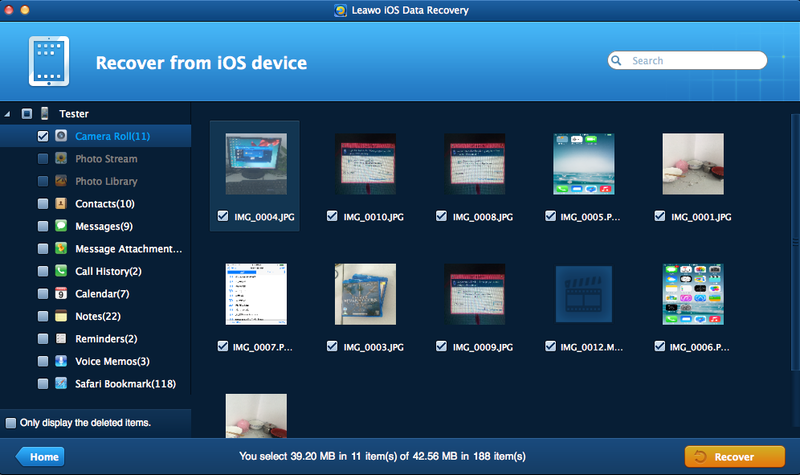 If you are about to backup iPhone photos to PC, you can take advantage of the Windows version of Leawo iOS Data Recovery. With these simple methods, you are able to backup iPhone photos to Mac with no efforts. Now you don’t have to worry about the thousands of photos you take with your iPhone. Both Leawo iTransfer and Leawo iOS Data Recovery can help users backup iPhone photos to Mac computers. And they have other different features to meet users’ needs. The table below will compare the two pieces of software for you. Dropbox is a similar cloud service as iCloud, but it is more user-friendly. Dropbox allows users to transfer photos from iPhone to Mac over Wi-Fi or USB connection. You only need to install Dropbox on your MacBook and iPhone, and log in the app with the same ID, then you are allowed to upload photos from your iPhone to Dropbox; if you think uploading photos one by one is a waste of time, you can plug your iPhone into MacBook via the USB cable, and then you can import iPhone photos to MacBook with ease. The Dropbox will provide limited free storage space, but it doesn’t limit the number of the photos you upload and never automatically delete old photos.